Tiger Bill Reviews On The Beaten Path by Rich Lackowski Book/CD from Alfred Publishing. If there's one thing I've learned over the past 30 plus years of educating drummers it's the importance of studying the drummers who came before you. You need to know where you came from to know exactly where you are going. This book and audio CD by Rich Lackowski fills that need quite nicely. Let's check it out. Regardless of whether you are a drummer specializing in Jazz, Funk/R&B, Alternative/Punk Rock, Metal, Fusion, Reggae, Jam, Classic Rock, or Progressive Rock drumming, the best drummers on the planet are those who have studied the legends who came before them. Even the legends themselves have done this. They have all stolen or, if you prefer, borrowed techniques and ideas from those who have come before them, modified the chops, and then added them to their own bag of tricks. Modifying the various elements that you borrow is the key to success. This is what allows you to construct a unique style of your own. Prior to the release of "On The Beaten Path:The Drummer's Guide to Musical Styles and the Legends Who Defined Them," drummers who wanted to learn about those who came before them would have their work cut out for them. Now they can find much of that information all in one place. Featured drummers include Travis Barker (Blink-182), Carlton Barrett (Bob Marley and The Wailers), Carter Beauford (Dave Matthews Band), John Bonham (Led Zeppelin), Danny Carey (Tool), Billy Cobham (Mahavishnu Orchestra), Tré Cool (Green Day), Stewart Copeland (The Police), Sly Dunbar (Sly & Robbie), Topper Headon (The Clash), Gene Krupa (Benny Goodman Orchestra), Keith Moon (The Who), Vinnie Paul (Pantera), Neil Peart (Rush), Mike Portnoy (Dream Theater), Buddy Rich, Max Roach, Chad Smith (Red Hot Chili Peppers), Ringo Starr, Clyde Stubblefield & John "Jabo" Starks, Tony Williams, and many more Author Rich Lackowski details 29 drummers from a wide variety of musical styles and includes brief bio and must-have recording info on nearly three dozen more. Even so, some of your favorite drummers are bound to be missing. To include everyone of importance in a single book would be an impossible task. Suffice it to say that this book will keep you in the woodshed for quite some time and, who knows, Rich might even decide to produce a second volume one day. The book is layed out in nine main sections each containing a time line along with biographical information on the most influencial drummers of that genre with photos and text/diagrams of their gear set ups. For each featured drummer, Rich includes a transcript of a trademark groove or solo and breaks each pattern down to make them easy to learn. Patterns are included for beginner, intermediate, and advanced level players. For those who may have trouble reading the written notation, an audio CD is included demonstrating each pattern. At the end of each chapter is a brief bio of other drummers of importance along with a list of their best must-have recordings. An audio CD is included that contains 85 tracks that demonstrate each pattern and solo that appears in the written transcripts throughout the book. Sevety-nine of these tracks were performed by author Rich Lackowski and six tracks by John O'Reilly Jr.
For drum instructors, a book like this makes our job much simpler. Rather than providing students with a list of drummers and music they should listen to, we can now work through this book with them, The layout is such that students will quickly pick up the tips and tricks of many of the drumming greats, enhancing their own bag of tricks along the way. For drummers looking for self-study material, this book provides a quick route to learning the trademark grooves and solos from the best of the best. Given time, you could learn the things that are covered in this text on your own but it would likely take you years to accomplish it. 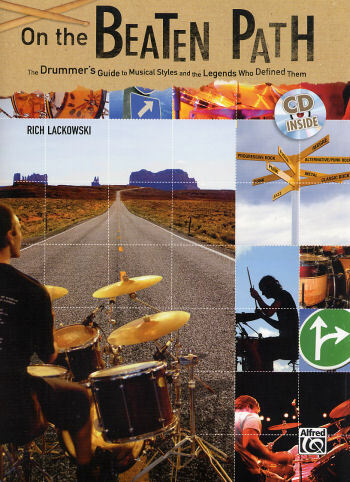 With "On The Beaten Path:The Drummer's Guide to Musical Styles and the Legends Who Defined Them," Rich Lackowski has done all of the grunt work for you. Regardless of your experience level or musical style, this book contains important information that no serious drummer should be without. Buy it, shed it, and you will add greatly to your existing bag of tricks.